This article is about the food. For the computer terms, see HTTP cookie and Magic cookie. For other uses, see Cookie (disambiguation). In most English-speaking countries except for the United States and Canada, crisp cookies are called biscuits. Chewier biscuits are sometimes called cookies even in the United Kingdom. Some cookies may also be named by their shape, such as date squares or bars. Cookies or biscuits may be mass-produced in factories, made in small bakeries or homemade. Biscuit or cookie variants include sandwich biscuits, such as custard creams, Jammie Dodgers, Bourbons and Oreos, with marshmallow or jam filling and sometimes dipped in chocolate or another sweet coating. Cookies are often served with beverages such as milk, coffee or tea. Factory-made cookies are sold in grocery stores, convenience stores and vending machines. Fresh-baked cookies are sold at bakeries and coffeehouses, with the latter ranging from small business-sized establishments to multinational corporations such as Starbucks. In most English-speaking countries outside North America, including the United Kingdom, the most common word for a crisp cookie is biscuit. The term cookie is normally used to describe chewier ones. However, in many regions both terms are used. In Scotland the term cookie is sometimes used to describe a plain bun. Cookies that are baked as a solid layer on a sheet pan and then cut, rather than being baked as individual pieces, are called in British English bar cookies or traybakes. Its American name derives from the Dutch word koekje or more precisely its informal, dialect variant koekie which means little cake, and arrived in American English with the Dutch settlement of New Netherland, in the early 1600s. According to the Scottish National Dictionary, its Scottish name derives from the diminutive form (+ suffix -ie) of the word cook, giving the Middle Scots cookie, cooky or cu(c)kie. It also gives an alternative etymology: like the American word, from the Dutch koekje, the diminutive of koek, a cake. There was much trade and cultural contact across the North Sea between the Low Countries and Scotland during the Middle Ages, which can also be seen in the history of curling and, perhaps, golf. 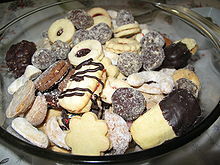 A dish of assorted cookies, including sandwich cookies filled with jam. Cookies are most commonly baked until crisp or just long enough that they remain soft, but some kinds of cookies are not baked at all. Cookies are made in a wide variety of styles, using an array of ingredients including sugars, spices, chocolate, butter, peanut butter, nuts, or dried fruits. The softness of the cookie may depend on how long it is baked. A general theory of cookies may be formulated this way. Despite its descent from cakes and other sweetened breads, the cookie in almost all its forms has abandoned water as a medium for cohesion. Water in cakes serves to make the base (in the case of cakes called "batter") as thin as possible, which allows the bubbles – responsible for a cake's fluffiness – to better form. In the cookie, the agent of cohesion has become some form of oil. Oils, whether they be in the form of butter, vegetable oils, or lard, are much more viscous than water and evaporate freely at a much higher temperature than water. Thus a cake made with butter or eggs instead of water is far denser after removal from the oven. Cookie-like hard wafers have existed for as long as baking is documented, in part because they deal with travel very well, but they were usually not sweet enough to be considered cookies by modern standards. Cookies appear to have their origins in 7th century AD Persia, shortly after the use of sugar became relatively common in the region. They spread to Europe through the Muslim conquest of Spain. By the 14th century, they were common in all levels of society throughout Europe, from royal cuisine to street vendors. With global travel becoming widespread at that time, cookies made a natural travel companion, a modernized equivalent of the travel cakes used throughout history. One of the most popular early cookies, which traveled especially well and became known on every continent by similar names, was the jumble, a relatively hard cookie made largely from nuts, sweetener, and water. Cookies came to America through the Dutch in New Amsterdam in the late 1620s. The Dutch word "koekje" was Anglicized to "cookie" or cooky. 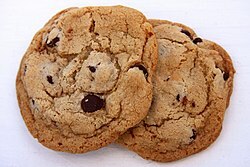 The earliest reference to cookies in America is in 1703, when "The Dutch in New York provided...'in 1703...at a funeral 800 cookies...'"
The most common modern cookie, given its style by the creaming of butter and sugar, was not common until the 18th century. Bar cookies consist of batter or other ingredients that are poured or pressed into a pan (sometimes in multiple layers) and cut into cookie-sized pieces after baking. In British English, bar cookies are known as "tray bakes". Examples include brownies, fruit squares, and bars such as date squares. Filled cookies are made from a rolled cookie dough filled with a fruit or confectionery filling before baking. Hamantashen are a filled cookie. Molded cookies are also made from a stiffer dough that is molded into balls or cookie shapes by hand before baking. Snickerdoodles and peanut butter cookies are examples of molded cookies. Some cookies, such as hermits or biscotti, are molded into large flattened loaves that are later cut into smaller cookies. No-bake cookies are made by mixing a filler, such as cereal or nuts, into a melted confectionery binder, shaping into cookies or bars, and allowing to cool or harden. Oatmeal clusters and Rum balls are no-bake cookies. 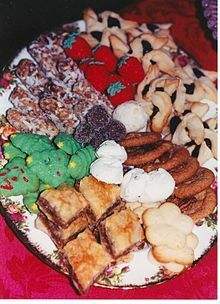 Pressed cookies are made from a soft dough that is extruded from a cookie press into various decorative shapes before baking. Spritzgebäck is an example of a pressed cookie. 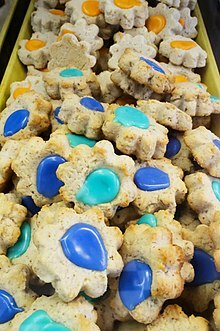 Refrigerator cookies (also known as icebox cookies) are made from a stiff dough that is refrigerated to make the raw dough even stiffer before cutting and baking. The dough is typically shaped into cylinders which are sliced into round cookies before baking. Pinwheel cookies and those made by Pillsbury are representative. Rolled cookies are made from a stiffer dough that is rolled out and cut into shapes with a cookie cutter. Gingerbread men are an example. Sandwich cookies are rolled or pressed cookies that are assembled as a sandwich with a sweet filling. Fillings include marshmallow, jam, and icing. The Oreo cookie, made of two chocolate cookies with a vanilla icing filling, is an example. Vegan cookies can be made with flour, sugar, nondairy milk and nondairy margarine. The icing can be made with aquafaba to decorate the cookies. Cookies also may be decorated with icing, especially chocolate, and closely resembles a type of confectionery. Hearts shaped Valentine's Day cookies adorned with icing. ^ a b "History of Cookies - Cookie History". Whatscookingamerica.net. Archived from the original on 2008-11-04. ^ a b c d e Nelson, Libby (29 November 2015). "British desserts, explained for Americans confused by the Great British Baking Show". Vox. Archived from the original on 2 December 2015. Retrieved 2015-12-03. ^ "cookie - food". Encyclopædia Britannica. Archived from the original on 2008-02-24. ^ "7 vertalingen voor het dialectwoord 'koekie'". Archived from the original on 2014-09-07. ^ Merriam-Webster's Collegiate Dictionary, Tenth Edition. Merriam-Webster, Inc.: 1999. ^ Lynne Olver. "The Food Timeline: history notes--cookies, crackers & biscuits". foodtimeline.org. Archived from the original on 2012-07-17. ^ van der Sijs, Nicoline (Sep 15, 2009). Cookies, Coleslaw, and Stoops: The Influence of Dutch on the North American Languages (Paperback ed.). Amsterdam: Amsterdam University Press. p. 125. ISBN 978-9089641243. ^ "History of cookies/biscuits". ochef.com. Archived from the original on 2008-03-02. ^ Miller, Jan (2006). Better Homes and Gardens New Cook Book. p. 251. ISBN 9780696224034. Retrieved January 6, 2017. Cumo, C. (2015). Foods that Changed History. ABC-CLIO. pp. 115–117. ISBN 978-1-4408-3537-7. Look up cookie or koekje in Wiktionary, the free dictionary.